Hey everyone! Welcome to NintendoSoup’s 28th giveaway! This week, we’re giving away a copy of Bandai Namco Entertainment’s popular music rhythm game, Taiko no Tatsujin: Nintendo Switch Version! This is the first Taiko no Tatsujin game playable in English on a Nintendo game console. Learn how to buy the physical/digital version here. 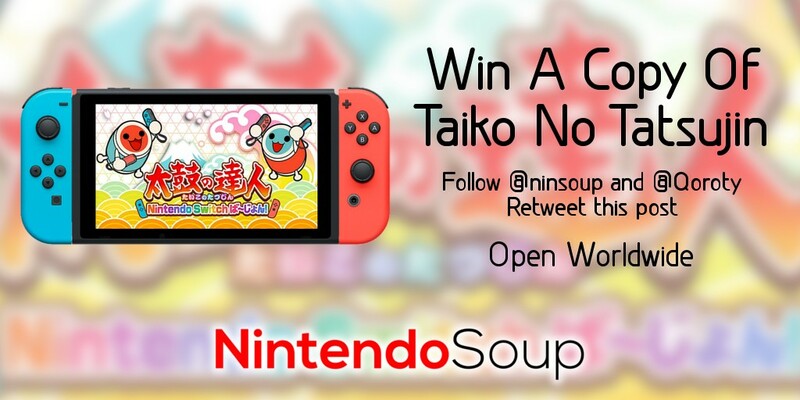 Win a copy of Taiko no Tatsujin #NintendoSwitch Version, playable in English! Follow @ninsoup and @qoroty, and Retweet to enter. Open worldwide, ends July 9 6am PT. Giveaway ends July 9, 2018 6:00am Pacific Time. 1 winner will be randomly chosen on Facebook or Twitter. Prize will be sent as a download code, redeemable on the Japanese region Nintendo eShop. Open to everyone worldwide. Feature, Giveaway, NintendoSoup, Switch, Taiko Drum Master Nintendo Switch Version!